During the week, AFL media reports our man Alan Richardson’s coaching record would be the worst since 1967 for coaches with 100 and more games being in charge of. What is the matter? Does the coach have to take all responsibilities to have such records? I say no towards both questions. He arrived at the club in a tough time when our Grand Final players started hanging up their boots. And he had to farewell Lenny, Nick and Joey while coaching the Saints. On the other hand, I wished Richo could have helped developing young players more. The coach responded positively as Alastair Clarkson and Damian Hardwick had been through tough coaching records before they became premiership coaches. I love Richo’s positive attitudes. But to be honest, I do not like footy media reporting negatively that Paul Roos is concerned about, or umpires and MRP/Tribunal treating St Kilda unfairly. My work roster had been changed twice before the match. At first, I was given only midday to 4pm at my usual workplace. Then on Thursday night, I was asked to do extra hours at another premise in town so that they would not have staff shortage. I agreed so that I could gain more money even if I would miss an opportunity to watch my beloved Saints in action live. As I am going back to Melbourne next month for the Maddie Riewoldt Vision Match against Richmond, I need money. The last change was made a night before, starting early at 11am that didn’t affect the footy. As it had been hot here in Kyoto, I got a spare T-shirt that was the Saints in New Zealand one on the game day. Another one I wore on the day was not wet, but I had changed to the Saints one before I started the evening shift at the town restaurant to show my support to the mighty Saints. While my boys were playing in Perth, I was at the hot spot of the kitchen either cooking deep fried beef or serving small plates. We have two cooking tasks in the kitchen – cooking deep fried beef, and the assistant who serves rice, miso soup, sauces and other small plates onto trays. I was switching these two positions on that night. Hot spot is in the forward pocket on the footy field, but that kitchen hot spot is in the back at the restaurant. These days, unfortunately or fortunately, I don’t play ‘forward’ that my language skills are hidden. Like the potential move for our young Paddy McCartin who could be in the back line rather than full-forward. After the busy night at work, I checked the final score. West Coast 101 St Kilda 88. It was not bad. Saints fought hard, I thought. On Sunday morning, I was thinking where I would watch the footy replay to gain the knowledge of the game. I learnt that we were eight goals trailled at the last break, so I decided to watch the match highlights until the third quarter at first and then all actions around these highlights and at last all of the last quarter. Match highlights don’t show all actions of the highlights, for example, handpasses and kicks from midfield and a forward takes a mark. Those videos are unlikely to show the forward kicking a goal. I hate AFL’s match highlights videos because I can’t watch all important actions, especially scoring goals. Tim Membrey had struggled with kicking straight this year, but kicked 6.0 on Saturday night. Saints manufacture was said by Fox Footy commentators at the last few minutes in the first quarter. Our strengths of the coast to coast was created by Steele and Billings being involved. Then Membrey ran to see the ball movement and find the right spot to take a mark. He took a chest mark and scored a goal. This Membrey’s action is to be implemented into my on field performances. In the sixth minute, Billings’ beautiful long kick was taken a mark by Membrey. His mission was done from 20-25 metres out straight. 13 minutes later, Saints created a good combination of long kicks, contests and handpass. Sinclair ran swiftly to avoid being tackled and to score a goal. In the last minutes before the main break, Savage’s long kick was dropped off by McCartin but picked by Newnes. He kicked long and scored a goal. Good back up! Another good back up was done by Billings at the beginning of the third quarter. Weller’s kick was delivered by a pack of Eagles. And footy was dropped and picked by Billings. Weller said his kick was average. In the eighth minute, Marshall was unable to take a high mark and LeCras took instead. Ball was spun and the Eagle used the right arm and hand well to keep ball on the air and get it on his hand. His action had already been in my player’s note from Round One when Acres did the same action. In the last two minutes, Kennedy put high pressures on Marshall and tackled him. Richo’s action on the bench seemed calm. The big Eagle forward turned back and scored a goal. Then Saints Express started notching up at the last quarter. 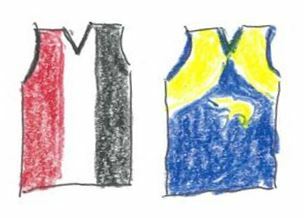 In the first two minutes, Weller’s contested mark was cut illegally by the opponent after the great works done by Ross and Membrey. Weller was awarded a free kick and scored a goal. It was his second goal in the 2018 season. Sadly our bad habit of wasting an opportunity came back shortly. Handpasses in the midfield was cut by a tackle. At the end, Gaff scored a goal putting back the margin to eight goals. When Membrey kicked a goal from the boundary line with left angle, Richo was still calm on his new downstairs office. Similar to the last minutes in the first quarter, Membrey ran to take a mark and then scored a goal at 13:13. Running and seeing ball movements to read are important to play footy. Skunk gained confidence on the day. Two minutes later, great works of turn over, back up and handpass were made. Gresham finished with a soccer goal. Saints put a lot of pressures in our goal square. At 19:49, Newnes kicked high to score a goal. While Richo stood up and showed emotion on the bench, his Eagle counterpart Adam Simpson put his hands on his head up in the box. Marks taken by Saints were great. McKenzie took an intercept mark and a good mark taken by Billings followed. Membrey took a mark inside 50 at the same spot short time ago. He kicked beautifully with his right leg. Simpson put his head down in the coaching box. Richo showed his enthusiasm with standing up and communicating with a headset on the bench. Gresham scored a goal without problem on the right. Simpson’s headache continued. But that was it. We lost, but were competitive against the club top on the ladder. Next weekend, we face Sydney Swans as the Pride Match at our home. Unfortunately my work shift on Saturday falls on the evening/night. As no work in the daytime, I am not happy that I will miss the prime time and blockbuster footy. As I have mentioned earlier, I am travelling to Melbourne next month. Leaving Japan on Wednesday, 18 July and arriving at Melbourne following morning. I am staying in Melbourne until 25 July. Flights have been booked. I look forward to catching up with you, and seeing you if I haven’t met you the last time. My fractured finger has been healed. But my ankle has been sore days and days due to kicking footy a lot. However it’s not bad at all and I practise and train footy with passions as always. My on field issue is that being nervous and scared in club trainings and on my own practices when many people are at the field. These emotions affect my kicking. I have to be stronger mentally. Recently I encourage myself to kick like Membrey on Saturday night. Also I keep in mind Stephen Milne urging our boys to have strong mental on the footy field. I keep practising and training to be competitive more and faith to the mighty Saints. I hope we fight hard against Swans on Saturday night. Nice work Yoshi. Soon you will be here in person. Thanks Yvette. I can’t wait my footy experience in Melbourne.